It was a brutal week for the Cubs’ minor-league system. There were two days in which it did not have a starting pitcher do well enough to get a pitcher of the day award. I wound up going with two relievers each day instead. Three of the four affiliates are under .500. Only Tennessee is exactly at .500. Meanwhile, Iowa has only won two games the last two weeks. In spite of that, there were several positives this week as Myrtle Beach seems to to have awoken from its early-season slump. Tyson Miller had a great start for the Pelicans earlier in the week going 7 innings with 7 Ks. Meanwhile in Iowa, Adbert Alzolay made his third start of the year and it was a dominant one going 7 innings with just 1 hit and 6 Ks. Then, last night, Adbert struggled. He only made it through 4.2 innings and threw 92 pitches in that time giving up 3 runs on 8 hits. And then there was Oscar de la Cruz who struck out ten last night while Matt Swarmer had another masterful performance going 6.2 IP with 7 Ks. Some hitters seem to be waking up as well. David Bote is hitting close to .500 since his return from Chicago. Wladimir Galindo is finally getting back on track after his post-DL stint slump. Yasiel Balaguert seems to have a had a good week for Tennessee (7 for his last 18) and Connor Myers is hitting the best he’s ever done in his two years as a Cub. He’s at .282 for Myrtle Beach. 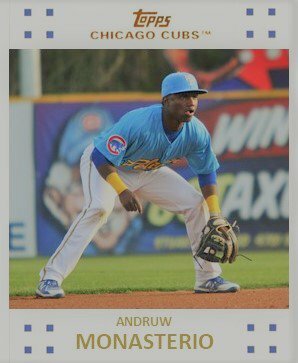 Andruw Monasterio is also coming back (6 for his last 14) after a little slump in late April. And Zack Short snapped out of his slump a bit with 2 home runs the other night and 2 more RBI last night. Reliever Bailey Clark was promoted to Myrtle Beach this past week and his debut week was very good going 5.2 innings in 2 appearances this week. He gave up a run but he struck out 9. Dakota Mekkes is just shutting teams down when he pitches. He still has some issues with walks, but Mekkes should be in Iowa soon. While there is no team with the record above .500 right now, I would not get too hung up on the affiliates’ win/loss record in the minors. It may seem depressing, but the real focus should be on player development. The Cubs have a lot of starting pitchers that are moving their way up through the system, along with some relievers, who could help to big league club in the short term. Their development, to me, is going to be the key storyline for the month of May. Dillon Maples, along with Alzolay, are near ready. Maples was averaging over 20 Ks per nine innings pitched until he threw a scoreless ninth last night without any Ks. That is odd for him. As for the hitters, the Cubs may not have any “elite” hitters, but they do have several who are worth paying attention to and to watch improve. Aramis Ademan and Miguel Amaya are two possible elite prospects and I am beginning to grow on Monasterio, who is only 20, and at high A, and doing well (.319). I really like watching Austin Filiere and Jared Young and their approaches to an at-bat for South Bend. Last night, Young went 3 for 5 with his third home HR in 13 games to go along with 3 RBI on the night. Filiere also cranked out his second of the year. 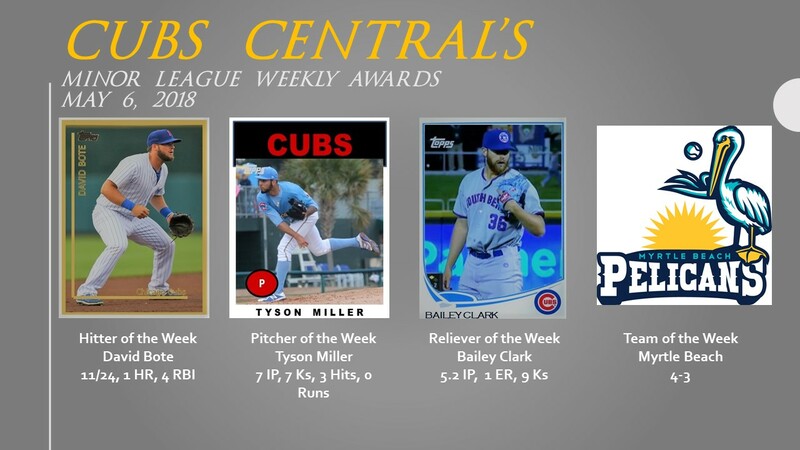 On Thursday, the Cubs announced their minor league players of the month. Like me, the Cubs selected Jeffrey Baez as the hitter of the month while the Cubs took Matt Swarmer, who I profiled earlier this week, as the pitcher of the month with a ridiculous 26/3 K/BB ratio in April. Last night, Swarmer improved that to 33/3 or 11 to 1. Wow! Also, reliever Chad Hockin underwent TJS this week and is out for the next year. Best wishes to him. He was one of my favorite kids to talk to last year in South Bend. The Cubs keep adding to their international free agent class. While most of the signees will play in the Dominican this summer, there are a few who could debut in Mesa including shortstops Luis Verdugo and Fabian Pertuz along with pitchers Florencio Serrano and Raidel Orta. Nelson Velazquez and Fernando Kelli are hitting well according the box scores from Arizona Phil. They begin regular season play in about 6 weeks in Eugene. Tomorrow, I am going to take a look at the Draft that will be held four weeks from Monday. At some point, I will also profile the development of Brendon Little, Tyson Miller, and Andruw Monasterio this week. The Midweek Report returns this week and I am not sure what it will be about. ‹ PreviousThe Friday Six Pack – What’s Up with Jose Albertos?